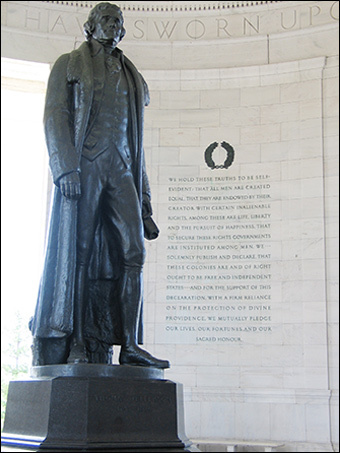 Thomas Jefferson believed that “legislators ought not to stand above the law they create but ought generally to be bound by it as are ordinary persons.” So noted the U.S. Supreme Court in its 1972 decision in Gravel v. United States. The ideas of liberty will stand forever. It is a principle based on plain fairness and common sense. And it is going to play a key role in the ongoing battle over ObamaCare. Every member of Congress who voted for the deceptively named Patient Protection and Affordable Care Act (ACA, or ObamaCare) knows that he is facing potential political extinction in the November 2014 elections because of that vote. That means the entire lineup of Democrats in the House and Senate, with the exception of Reps. Jim Matheson (D-Utah) and Mike McIntyre (D-N.C.). President Barack Obama is facing one of the toughest tests of his political life: a Democratic revolt that threatens to do irreparable harm to his signature legislative achievement. There is plenty in the mammoth ObamaCare program to anger everyone. But perhaps one of the most troublesome issues that will plague congressional Democrats in the coming election is the matter of the controversial exemptions to ObamaCare that the Washington ruling class arranged for themselves. ObamaCare cheerleaders vehemently insist that it is wrong to call the special privileges they are receiving “exemptions.” Technically they may be correct, but substantively they are wrong. The ACA, thanks to constitutionalist and Tea Party Republican opposition, does indeed require that members of Congress and their staffs purchase healthcare insurance provided under ObamaCare. However, as we have reported in previous articles (here and here), Democrat and Republican leaders later connived with President Obama to have the Office of Personnel Management (OPM) come up with an illegal ruling that allows members of Congress and their staffs to keep the luxurious Federal Employee Health Benefits Program (FEHBP) “Rolls Royce” subsidy that pays for 75 percent of their premium costs. This amounts to $5,000 in subsidy for an individual plan and $11,000 for a family plan. Members of Congress insisted that Capitol Hill would be hit with a terrible “brain drain,” as staff members would leave if they had to pay for their own health care without these subsidies. The same congressional whiners making these complaints have not shown the same concern for the tens of millions of Americans they have pushed into the same situation with the ACA. The ordinary citizen facing ObamaCare sticker shock cannot simply vote himself a fat subsidy. This is not the first time, of course, that Congress has exempted itself from laws it imposes on the rest of us, or provided itself with special privileges. A continuing sore point with many taxpayers is the cushy pension system that Congress has bestowed on its members, in addition to the many other perks they have voted for themselves. Members of Congress become fully vested in the retirement system after only five years of “service” and receive payouts far in excess of what their constituents receive in the private sector. Only two members of Congress, Rep. Ron Paul (R-Texas) and Rep. Howard Coble (R-N.C.), have steadfastly stood on principle and refused to participate in the system, claiming that it is inappropriate and immoral to saddle taxpayers with the bill for this extravagant pension plan for privileged politicians. “Without which every government degenerates into tyranny.” That’s pretty strong. And who will argue with Madison on that point? Almost every day that passes brings new evidence that federal bureaucrats and federal politicians are becoming more and more a class of privilege and oppression, like the nomenklatura, the small, Communist Party elite that ruled the old Soviet Union and other communist states.